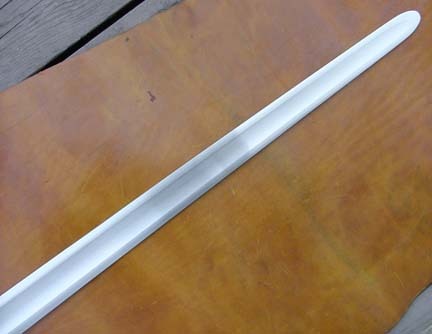 The hilt on this practice sword is of a little known style: the Wallingford Bridge type. The stunning Viking sword from river Witham (now in the collection of the British Museum) is one good example of a surviving Wallingford Bridge-type hilt. 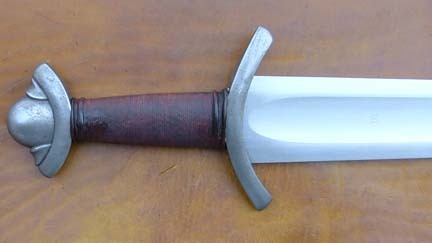 The upper and lower guard are both curved, like on the Anglo Saxon type L hilts, but the pommel does not have the exaggerated peak that is so typical of those hilt types. Rather, it is similar to the pommel shape of the Petersen R- and S- types. 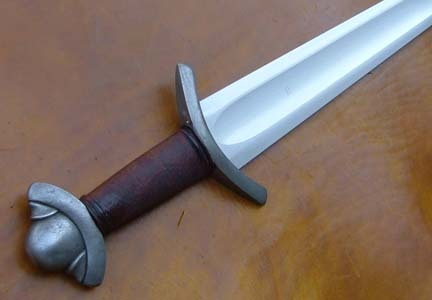 It seems probable the type is the result of Norse and Anglo-Saxon culture mix, and would belong to the 10th C.
The sword features rounded edges, stainless steel hilt components, and a dark brown leather-wrapped grip. This sword would be a suitable practice equivalent for the Next Generation Thegn.